I guess when you live in Australia, maybe having two snakes crash through your ceiling is their version of finding a cockroach in your sink. Except I don’t thin I’ve ever seen two cockroaches fight it out over a mate. 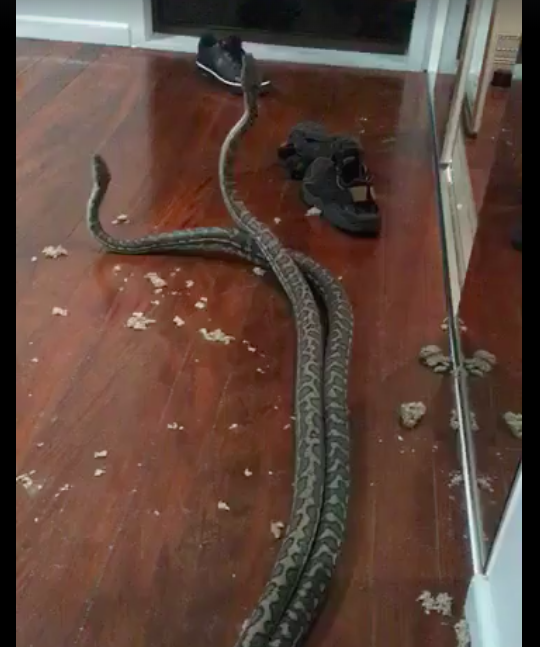 In any case, as you can watch in the absolutely horrifying video below, two snakes flew through the ceiling via a vent in an Australian home in Brisbane, and the person recording the video could not have been calmer describing what it is exactly they are doing. Seriously, check it out. If a wild animal burst through my wall, I wish I could just start listing off obscure facts about them! The reason the woman knew so many obscure facts though? Why, the lady was Lana Field, a woman who was in the employment of Snake Catchers Brisbane, and I am assuming she is here to catch the snakes in question. “This pair has been a bit naughty”, said Field of the 5.7 foot long snakes wrestling in the bedroom after using the blunt force of their powerful snake bodies to burst through the vent. Field continued to watch the snakes from a safe distance, and explained that while many think that when snakes are entwined like so that they are mating, when in fact they are battling over a female snake in the area! Ah nature, it’s so disgusting and violent and awful. 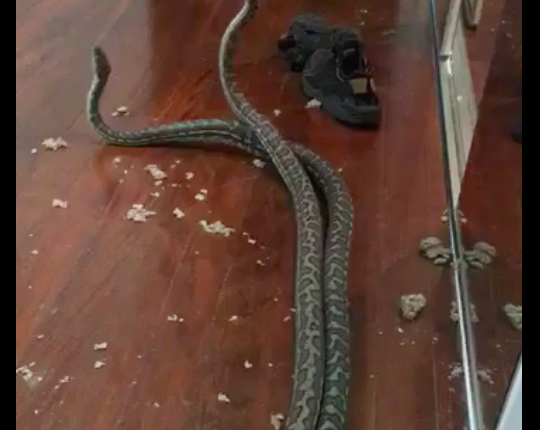 Two horny violent snakes were fighting each other so hard they flew through into someone’s room. I mean, look at that bare mattress. Whoever lives there hasn’t even moved in yet, and already they have insane looking snakes fighting it out in their living room, and animal control people giving subdued, good natured narrations of the sort of destruction happening. Too much, man.